Spring has sprung and if you’re looking to take in the natural beauty and fantastic florals of Niagara Falls this season, then make sure to check out these amazing Niagara Falls spring flower attractions. This beautiful 99-acre area is located along the Niagara Parkway and features gardens full of azaleas, perennials, and rhododendrons along with a remarkable rose garden that has over 2,400 roses. 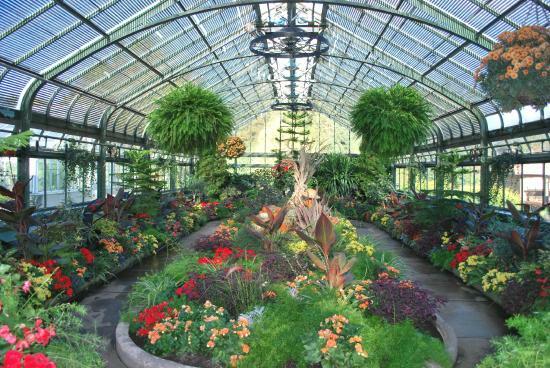 In addition to these flowers, there are herb and vegetable plantings, a parterre garden, and the Niagara Parks Butterfly Conservatory, which features over 2,000 tropical butterflies. These gardens are incredibly maintained as they serve as the outdoor classroom for Niagara Parks School of Horticulture students, and offer the perfect spot for an afternoon stroll in spring. The annual Spring Show is on now until Easter, and beginning on Easter weekend there will be a special Easter Show that runs for two to three weeks. and over 500,000 daffodils in bloom in spring, it’s one of the city’s most beautiful outdoor areas. Oakes Garden Theatre, located directly across the street from the Sheraton on the Falls, serves as the entrance to Queen Victoria Park and also features beautiful Niagara Falls spring flower and plant displays along with spectacular views of the American and Horseshoe Falls. This intricate and unique timepiece is located along the Niagara Parkway and full of colourful flowers in spring. The face of the clock is filled with more than 16,000 carpet bedding plants and changed twice a year. In spring, the clock is filled with viola and is always kept in working order to tell the time. There are also wonderful bedding displays surrounding the clock and chimes that go off every quarter hour to add to the one-of-a-kind experience. 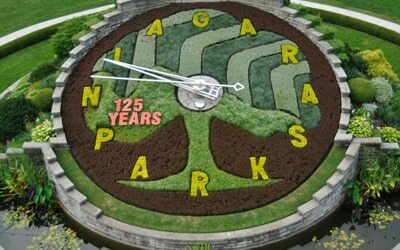 The Floral Clock is one of Niagara’s enduring attractions, operating since 1950. See Niagara fully in bloom this spring, and stay at the Sheraton on the Falls Hotel. View our Fallsview Hotel Rooms.